A Sorghum field on Songo Mnara. © H. McParland-Clarke 2013. We stand, the hot sun beating down on us, surveying a field of sorghum (mtama). The harvest is late this year, M tells us that the crop is short and stunted because of the drought (ukame) and as a result, very little has been harvested, even this late in the season. Low rainfall during the rainy season has a major impact on agriculture on an island which has no fresh water for irrigation. 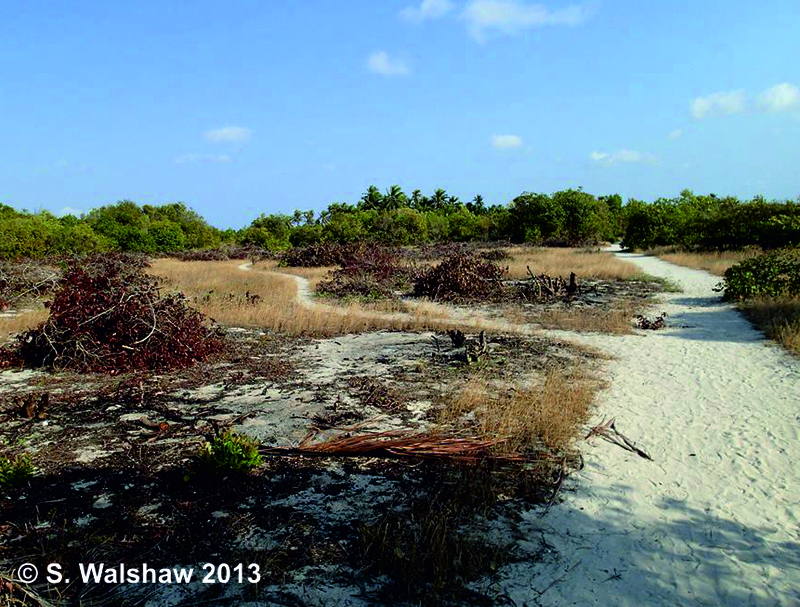 Drought (Ukame) has affected the growth and yields of crops on the island for several years, exacerbated by soil exhaustion. Local farmers cultivating pearl millet (uwele) and garden crops, including tomatoes (nyanya), experienced poor harvest and poor growth due to the lack of rainfall. Kilwa Kisiwani has a plentiful supply of fresh water, but on Songo Mnara local wells contain brackish water. During our visit, we witnessed the construction of water reservoir tanks on Songo Mnara, installed by the World Monuments Fund to capture water during the rainy season to provide the island with fresh water during the dry season. The road, Songo Mnara. © S. Walshaw 2013. We traversed sandy footpaths between sparse settlements, these roads, speckled with coral, guiding us through dense bush. The bush cleared, opening out onto a blackened clearing, a herd of cattle steered along their grazing route by a herder wielding a stick, on land subject to slash and burn. Once commonly used, slash and burn agricultural practices have been declining on the islands; traditionally sorghum (mtama), would be planted for three to five years, before being burned after the final harvest and left fallow for up to five years. Though fishing (uvuvui) and agriculture (kilimo) form the main basis of the economy, families also graze small herds of cattle or goats in the bush and fields. Farmers here don’t own the land they farm, only the crops they plant and the fences constructed to protect their crops; the land they farm is common land, owned by the community. Land is passed on through ancestry and kinship and new farmers must consult the community before claiming land. 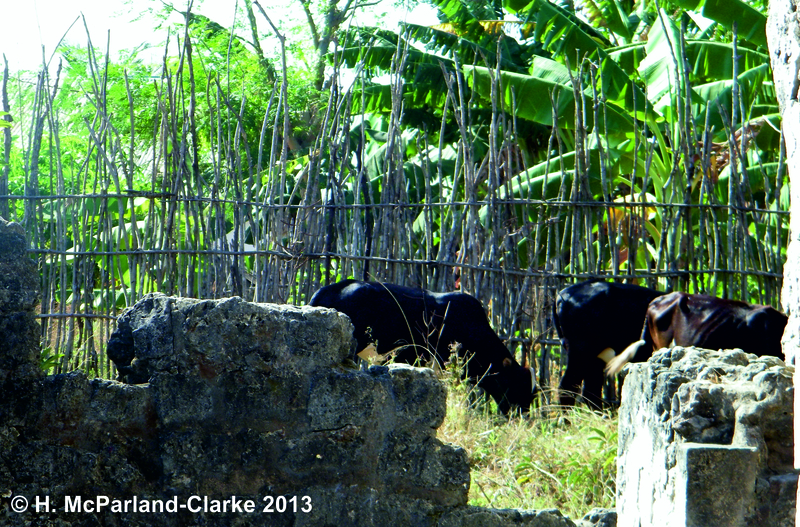 Cows amongst the ruins of Kilwa Kisiwani. © Hayley McParland-Clarke 2014. We meet M, one of these new farmers, sitting on coconut palm mats outside the home he shares with his wife and children, chickens pecking at the dry sand. M tells us that they moved from the other side of the island to farm this land. Songo Mnara may not seem to be the most hospitable environment for agriculture, but M chose to move to his present location, as the soil – a fine reddish sandy loam – is good for cultivation, despite the large coral inclusions which are problematic. The fields are prepared for planting by cutting back bush and palm and burning the vegetation, adding valuable nutrients to the soil. Sorghum (Mtama) is sown after the first rainfall in December, to be harvested five months later in May. Much like other crops, including rice, only the seed head (inflorescence) is harvested, with the remainder of the plant, the stem and the leaves, left in the field, these will be burned the following December prior to cultivation. Aside from the nutrients added from slash and burn, the crops are not intentionally fertilised and are not irrigated, watered by rainfall only. The soil is not intentionally improved in any way, though M grows peas (ufuta) alongside the sorghum (mtama), this crop is low maintenance, and harvested simultaneously. 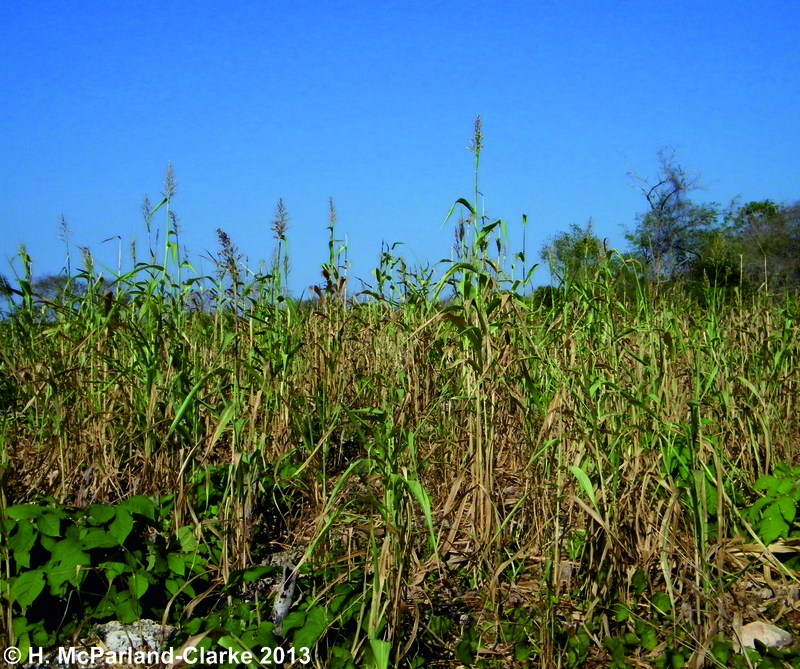 The stalks of the plant remain in the field to be burned with the Sorghum stalks. This process is more than efficient intercropping, the burning of the plant stems following harvest of the peas in the field, likely releases large amounts of nitrogen into the soil, improving soil fertility. Though sorghum is particularly suited to harsh environments, the annual addition of nitrogen to the soil is likely to have a significant effect on the yield. Papaya plantation, Songo Mnara. © Hayley McParland-Clarke 2013. We moved on, Y led us away from the ruins of Songo Mnara, through the bush to his village, to his home of coral and daub, to meet his family and to show us his farm. Y did not sow any crops this year, as he was on the mainland so that his children could attend school, though his large papaya (papai) plantation was in fruit. Y told us that papaya was good to grow, as each tree lived for up to four years, producing a crop of up to 50 papaya (papai). The trees required very little management, receiving water during the rainy season (December-May), requiring no fertilisation and self-seeding, though up to 20 cuttings could be taken from a single tree for replanting. 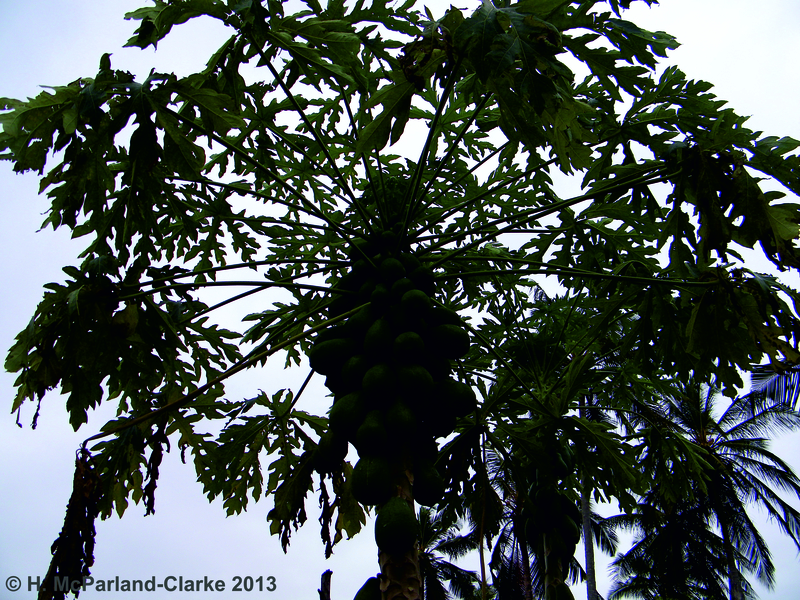 Y told us that papaya (papai) trees were an excellent investment. 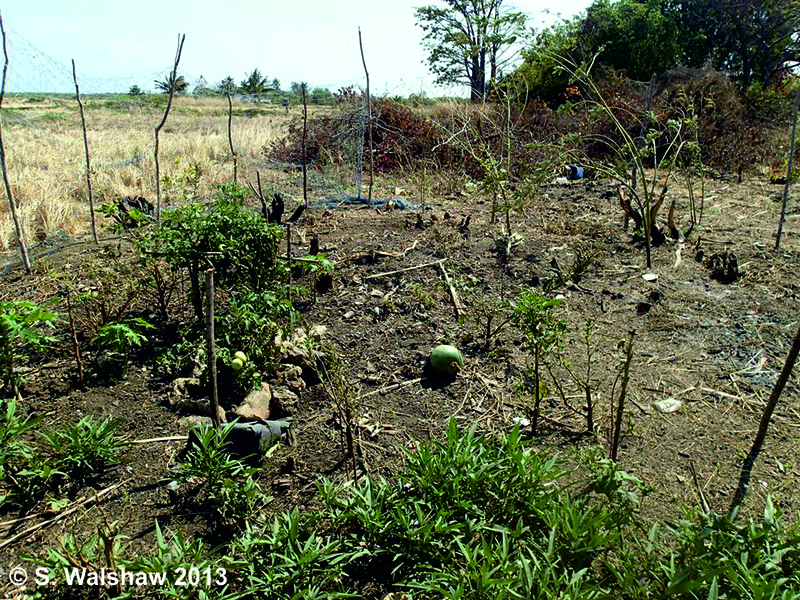 Three further papaya trees were grown in the toilet (choo) to the immediate rear of the house, rather than in the fields (shamba), for easy access, and presumably, good fertilisation! 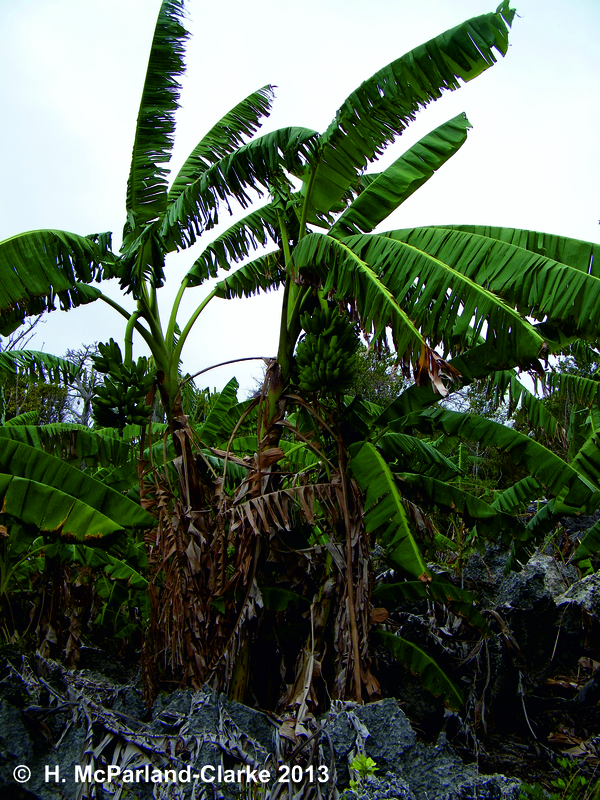 Banana Trees growing in pockets of coral on Songo Mnara. © Hayley McParland-Clarke 2013. Later, we joined R in a substantial plantation of bananas (ndizi), set in a small coral hollow filled with pockets of dark reddish-brown sandy loam. The hollow was high sided, with a narrow entrance through the rock, fenced off with logs to protect the plantation from bush pigs. Bananas (Ndizi) are planted in December at the start of the rainy season, each crop being transplanted from the previous crop, ready for harvest between May and July. During harvest, the trees are cut down, the fruit is removed in the field and taken back to the home, where some is stored, and some is sold at market. The trees remain in the plantation, drying, decomposing and entering the soil, providing the only fertilisation the crop receives. Y and R told us that their village was a good location for growing Banana and Millet, though they had experienced drought (ukame) and were unable to grow crops which required a lot of water, including Tomatoes (nyanya). More recently, farmers on Songo Mnara and Kilwa Kisiwani have moved away from traditional sorghum or millet cultivation, which although staples, are of little commercial value; instead, planting crops which will provide a staple in their diet and a cash crop for sale, including banana (ndizi), cassava (muhogo) and maize (mahindi). Households often cultivate small plots (bustani), growing a wide range of vegetables and fruits including tomatoes (nyanya), squash (malenge), pumpkins (maboga), okra (bamia), beans (maharage), lima beans (fiwi), peas (ufuta) and sweet potato (viazi vitamu).Large scale cultivation often takes place in a more suitable location some distance from the home. A bustani, a garden on Songo Mnara. © S. Walshaw 2013. Though most farmers I met also cultivated rice, there is only one location on the island suitable, at Madaweni, a three hour walk from the Songo Mnara ruins. Farmers grow rice in a communal field, traversed by raised berms, embanked to separate the field from the adjacent salt flats and saline incursion.The fields are not irrigated and are fed only by rainfall. This seems like a hostile environment to grow rice, but it’s important, rice is now a daily staple, but demand outstrips supply and so rice has to be imported for consumption. The farmers select the best rice each year, to plant the following year, slowly adapting the rice to its unique environment. The seed head (inflorescence) of the rice is harvested and stored in the home, whilst the leaves and stems remain in the fields. .
Madaweni Rice Fields, Songo Mnara. © S. Walshaw 2013. 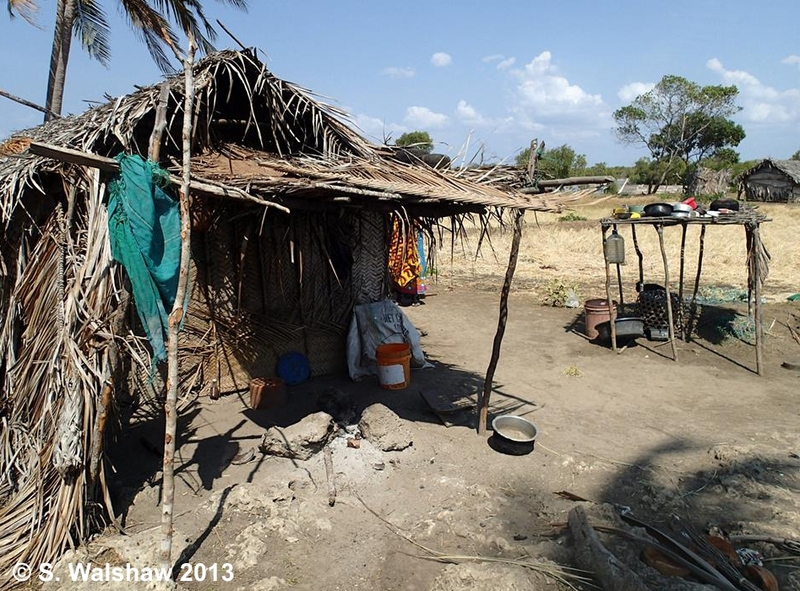 Families live in field houses, constructed of Coconut palm leaves (Makuti), for up to three months a year, in order to protect and maintain the crops. Crops must be weeded, but M tells me there are weeds which will affect the crops and weeds which will not. Only those which will affect the crops are removed. A field house on Songo Mnara, viewed from the rear kitchen. © S. Walshaw 2013. Out in the fields ants are swarming over our feet, crawling up our legs, but M doesn’t even notice them. I try not to not to notice them too, my fear of harmless insects is a joke amongst the locals, who laugh at my very British fear of ants and bees. They’re used to them, ants are everywhere on the island. I ask each farmer we meet, whether there are insects which will damage the crops, but each time, they reply that there are no insects which worry them; though a recent UNESCO report identified disease and insect infestation as threats to rice and coconut crops on Kilwa Kisiwani and Songo Mnara. All of the farmers are worried about bush pigs as they attack crops, biting at Banana (Ndizi) trees until they bleed and dehydrate to the point of death, eating the leaves of Sorghum or Millet. 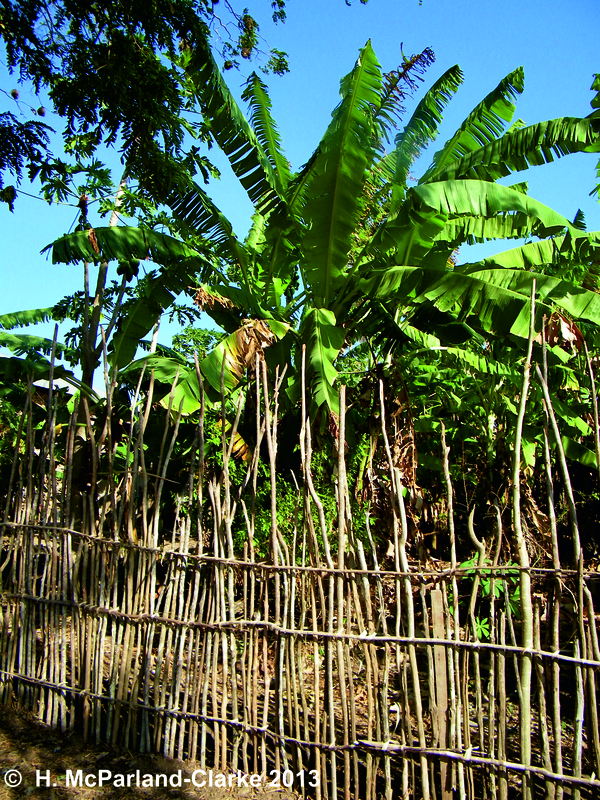 Banana trees fenced for protection on Kilwa Kisiwani. © Hayley McParland-Clarke 2013. We walk back across the island, it’s getting dark and the paths will be hard to see, we take a shortcut across the beach to the east of the island and we meet the ladies who cook for us, walking home, carrying their belongings wrapped in kangas on their heads, laughing. This post presents a somewhat limited ethnography of farming (kilimo) on Songo Mnara. I interviewed several farmers on the island and they gave me a tour of their farms. Sarah Walshaw kindly conducted the interviews with the rice farmers. It’s important to note that all of the farmers interviewed accepted that the drought was problematic, but overall they were positive about their environment, it suited their needs and they saw it as good land for farming. They were proud of their land, their crops and their farming (kilimo) ability, and rightly so. Farming such a specific environment with water constraints requires crop adaptation and local knowledge, handed down from generation to generation. Limited land resources on an island are managed through common land and communal farming. Those who participated in the interviews were pleased to give me a tour and share their knowledge and I am grateful to them for doing so. The farmers I spoke to on Songo Mnara were pragmatic, and felt able to invest in their crops to produce a surplus for market. Names and details have been changed to protect the identity of the farmers and their families. Related Posts: From the Site Diary: Approaching Songo Mnara Day of Archaeology 2014 – Counting Phytoliths from Songo Mnara, Tanzania References:  Bacuez, P.J. 2009. Intangible Heritage, Tourism and Raising Awareness on Kilwa Kisiwani and Songo mnara. UNESCO office, Dar es Salaam, Tanzania. Dr Sarah Walshaw (pers. comm. ).